A few days ago, my town was hit with a violent wind storm. Gusts reached 80 miles an hour, and over 100,000 homes were stranded without power for days! 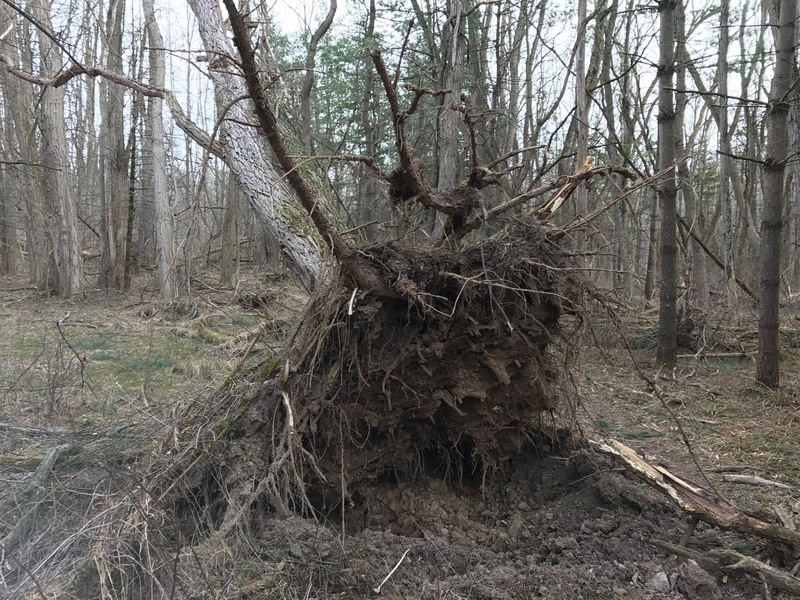 A day after the storm passed, I went for a trail run and was completely surprise by the destruction in the woods near my house. Huge, majestic trees I have run past for years, littered the forest floor, frequently blocking the trail completely. During my run I noticed there were two types of trees that were knocked over by the wind. Some of the trees had simply snapped as a result of the intense wind. Upon closer examination it was clear that although they looked healthy on the outside, these trees had rotten cores. Previously ravaged internally by some type of disease or lack of nourishment they stood no change against the violence of the wind. The second type of tree that was knocked over were not broken in half, but rather completely uprooted. These trees seemed to have roots that spread wide and shallow. However, now they were sprawling up into the sky, as their trunks lay horizontal across the trail. Unfortunately, these widely spread roots were no match for the windstorm, as they didn’t go deep enough to hold these trees upright. While many trees were destroyed, the vast majority remained standing. Those that were not destroyed must have had a healthy core and deep roots. As I finished my run, the parallel to my own life began to crystallized in my mind. I want to successfully navigate the storms of life. In order to do so and remain standing tall and secure, I need to ensure my inside core is healthy and that my roots are deep. It doesn’t really matter how I look on the outside… what matters is the condition of my core inside and depth below the surface. Guard Your Core – Our core, like the diseased trees, can so easily deteriorate over time. We must nurture and protect our heart, frequently examining it to ensure it remains healthy and strong. “Above all else, guard your heart, for everything you do flows from it.” Proverbs 4:23. When the next storm come into your life, will your core be strong and healthy enough to endure? Will your roots be deep enough to weather the storm? Sent from my cell phone.